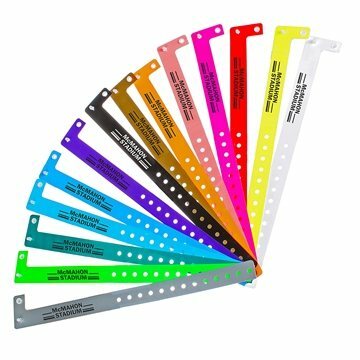 This plastic wristband, with snap closure, is non-transferable to provide added security at any event. This one time use wrist bracelet is stretch resistant and waterproof, making it a great product for admissions, ticketing, special events and more. Sequential numbering is available for an addtl charge. These handy wristbands are available in vibrant colors and ready for your custom imprint! Looked great and everyone was happy with it. the very cute design was an bonus to its eco friendly make. We gave these away during the county fair and it was a hit among the kids and moms. We ordered the bracelets for our Students Against Destructive Decisions (SADD) fundraiser. These products turned out well for all of us. the logo was perfect and the quality of the product is excellent.